Outside the Rat Race: Apple Is A New Religion? Apple Is A New Religion? Well, I recently read an article that managed to get me fired up again. This one came from Fox News and was talking about how Apple is like a religion. It was titled "For Apple Followers, It's a Matter of Faith, Academics Say". Specifically, they bring up four reasons that "Apple is the new religion... It's not a matter of rationality, it's a matter of faith." Each reason is, in my opinion, a half truth. On the surface it seems to make sense, but a half truth amounts to nothing more than a full lie. The part that really upsets me is not that he's attacking Apple, but that he's cheapening religion. OK. Let's dive in. 1) "Apple's creation story epitomizes the humble garage origin of its technology -- not unlike the humble manger of Jesus' birth." That's a little bit of a stretch. What company didn't have humble beginnings? HP also started out in a garage. This is hardly something special. Furthermore, being born in a manger is not what makes Christ special. It's the fact that Christ is God: all powerful, who could have chosen to be born anywhere, yet chose to be born in a manger. I'm pretty sure Apple didn't have the choice to start in any venue they wanted. 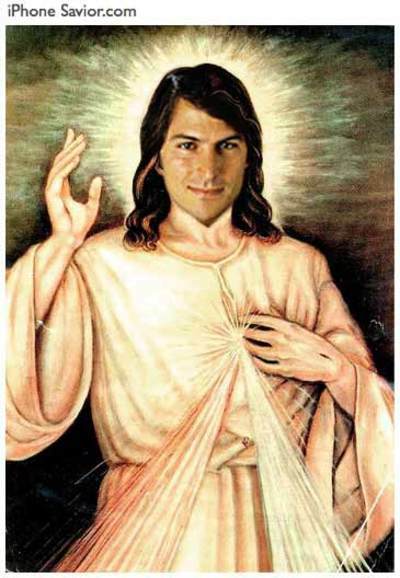 2) "Apple CEO Steve Jobs is perceived as a messianic leader who was fired but rose again to save the company." Really? OK. On the surface I see the similarities, just like Simon in Lord of the Flies. Still, the huge difference is the reason behind the "death". Jobs was let go because he wasn't doing a great job of running the company. When Christ died, he was innocent - he had done nothing wrong. Furthermore, even though Christ was blameless, he took everyone's wrong-doing (aka. sin) with him. So it isn't the act of just dieing and rising up that makes Christ who He is. It's what he did during that time and why he did it. 3) "Apple has traditionally had an evil archenemy, the Devil, as represented first by Microsoft and now by Google." I don't like this comparison because Christianity isn't about fighting an enemy. Sure, there is the struggle against sin, but that's not the point. The point is to worship God. To focus on the enemy is a mere distraction. Besides, any person or organization that takes a stand will inherently create some "enemies" who disagree. 4) "Its tablet computer can't play most of the videos on the Web ... its cell phone has trouble making voice calls ... and yet its products are wildly popular... It's not a matter of rationality, it's a matter of faith." The implication here is huge (and gets to me the most). They're saying that people are buying Apple products irrationally, because they don't work... I guess. This is actually the driving force behind this article. According to the article, the implication is that this is the same way people have an irrational faith in Christ. First, their claim that Apple's products are not great is simply unfounded. Consumers are smart and if the products don't work, people will return them. In 1995 Apple was on its way to bankruptcy because their products weren't great. So people were able to figure it out then, and are even more savvy than ever before. Second, Faith in Christ is also not irrational. I won't go into it here, but instead point to two great articles that show, rationally, how real Christ is. The first is called Lord, Liar, Lunatic and the second is Evidence Of The Resurrection. Well, I feel better. Apple is not a religion and faith is not irrational.